Nail biting is a common nervous habit like tooth grinding, hair twisting, picking at skin etc. The term Nail Biting refers to the act of biting nail, cuticle and soft tissues surrounding the nail. Children and young adults are more prone to develop this habit. Medical term for Nail Biting is Onychophagia. Getting rid of this habit is quite difficult because in most of the cases people do not even realize when they start biting their nails, whether due to anxiety or mere boredom. Interestingly, it has been observed that individuals tend to reduce and stop Nail Biting by the time they reach the age of 30. Effective treatment for Nail Biting depends on addressing the underlying cause and taking adequate measures to stop biting nails. Natural home remedies for Nail Biting help a great deal in curing this problem. Different individuals may have different reasons for biting their nails. More often than not, individuals tend to develop the habit of Nail Biting in response to stress, anxiety and insecurity. Hereditary factors may also contribute in the same. Moreover, in severe cases it can also be a sign of compulsive behavior and require behavior therapy for proper treatment. Therefore, it is often recommended to keep a journal to record when and where you bite your nails so as to identify the exact cause. A useful tip in this regard would be to look for signals like cupping the hands, rubbing the face or running the thumb along the edges of nails before biting nails. Symptoms of Nail Biting include issues like red and sore finger tips. It can lead to bleeding from cuticles and increase the chances of contracting bacteerial or fungal infections. Chronic Nail Biting tends to affect the rate of nail growth adversely and lead to nail deformities. It can also cause dental problems and gum injuries. Besides, swallowing bitten off nails can give rise to stomach ailments. • Distracting the mind and substituting the habit with other activities requiring oral fixation like chewing a sugarless gum, sucking a candy or lollipop are the most popular natural home remedies for Nail Biting. You can also engage your hands in other activities like squeezing a stress ball, grabbing your knee or arm rest of a chair or any other object for a few minutes to resist the urge to bite your nails. • Cutting the nails short, filing them in round shape and removing the sharp edges is another valuable natural remedy to stop Nail Biting. This is because you are more likely to be tempted to bite your nails when you notice sharp points on the edges. • Getting manicure and regularly massaging the skin around the nails with olive oil or vitamin E oil is useful in healing the condition of nails. These measures also motivate one to control the habit in order to maintain healthy and attractive nails. Keeping the nails and cuticles clean to avoid infections. • Applying clear nail polish with nasty taste is one of the easiest Nail Biting home remedies. Acrylic nails can also be used. • Wear light cotton gloves when at home to avoid biting the nails. Coating the nails with lemon juice or other bitter tasting substances can also help discourage this habit. While following this home remedy, try to avoid rubbing your eyes, open wounds or other sensitive areas. • Home remedies for Nail Biting natural treatment can also involve the use of relaxation techniques like meditation to reduce nervousness and stress. 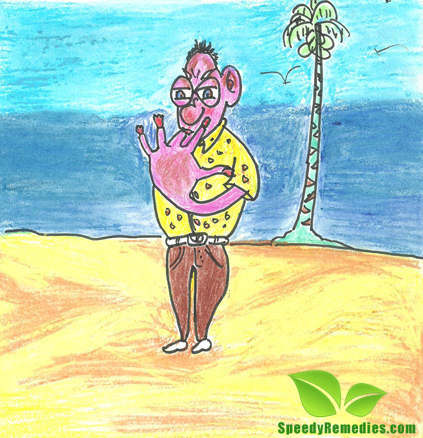 • Hypnotherapy can help identify the exact cause and then cure Nail Biting problem. As Nail Biting tends to cause nails to become weak and brittle over a period of time, try to include more protein and sulfur rich foods like apples, grapes, cucumbers, nuts, beans, soya, onion, garlic and dairy products. This is more of a subconcious habit that be broken with the help of natural home remedies for Nail biting and a good dose of patience, perseverance and motivation. hope these works 4 me cause i just cant stop biting my nails….